Moderate. Young seedlings often escape damage from light frost, but may be injured by sudden freezes. Tulip. 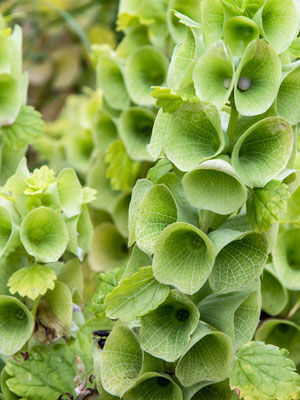 Bells of Ireland can grow to 4 feet (120 cm) tall, so they are best used as background plants. Sow seeds where you want the plants to grow in early spring, as soon as the soil can be worked. Or, start seeds indoors in late winter and set out the seedlings while the soil is still cool. The tiny flowers hidden within the shell-shaped calyxes are surprisingly fragrant. Cut stems for flower arrangements when half of the bells on a flowering spike are open. When growing bells of Ireland for drying, allow the spikes to remain on the plants until all the bells have opened. Seed germination is often better outdoors than indoors because the seeds are exposed to cold, wet conditions. In many climates, bells of Ireland reseed themselves when given the opportunity.